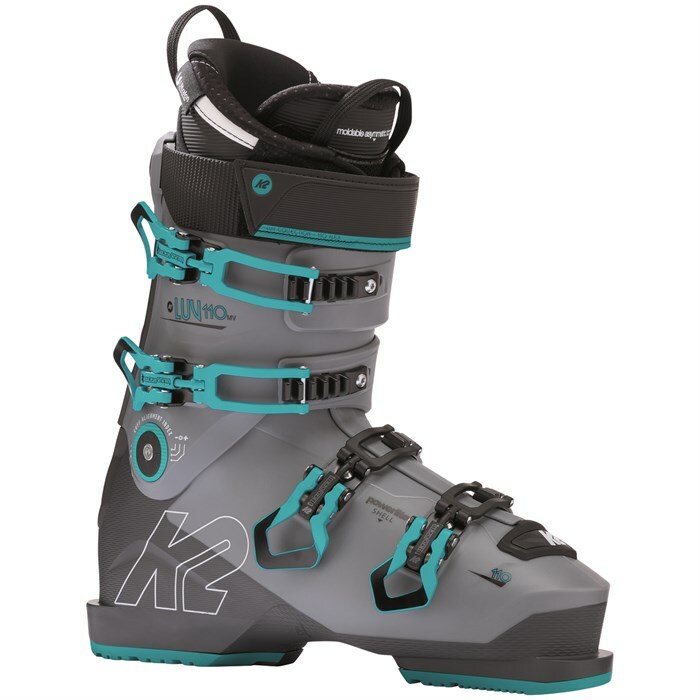 Light, quick, powerful AND comfortable, that's the K2 Luv 110 MV Ski Boots. K2 s newest boot design features a multi-durometer, multi-wall thickness design called Powerlite, along with a medium width and stiff flex best suited to aggressive expert ladies with average to mid-wide feet. A custom heat moldable liner and women's specific cuff and last round out the Luv 110 LV Ski Boots as one of the most advanced expert-level women's all-mountain boot designs around. Last: 100 mm  Perfect for most average width, average instep height feet. Women's Specific Last  A lower cuff height, volume and narrower heel to accommodate women's lower leg and foot shapes. Women's Adjustable Cuff  Adjustable rear cuff support that can be customized to fit with any calf shape. FastFit Instep  Softer TPU materials designed into the instep area of the Powerlite shell for quick and easy entry and exit. Custom Thermo Shell  The shell can be heat molded, punched, ground and customized with your favorite boot fitter for optimized comfort and performance. The shell can be widened up to 6 mm with this process. Flex: 110  A very stiff flex, suitable for advanced to expert skiers. PrecisionFit Pro Liner  Pre-molded and lasted with Ultralon heat moldable foams. Features an asymmetric tongue, pre-molded ankle pockets and a high density power collar for a firm but comfortable performance fit. Powerlite Shell  The totally new Powerlite shell is purpose-built to result in the best skiing, lightest weight boots ever produced. Made with four different stiffnesses of TPU and optimized wall thickness profiling, the Powerlite shell achieves a paradoxical balance of lightweight agility and power. The resulting boots weigh in as some of the lightest alpine boots on the market, yet they ski with all the power and drive of heavier boots. PowerFuse SpYne  A rear co-injected “Y” shaped design that adds strength and power to the Energy Interlock, the PowerFuse SpYne maximizes fore/aft flex efficiency and lateral stiffness for sustained performance and responsiveness in all terrain. Because of the SpYne, K2 is able to optimize materials in the cuff and shell, eliminating excessive vibrations in rough terrain. Energy Interlock  A rivet-free technology that integrates the cuff and shell, putting less stress on the boot's material and produces a smoother, progressive flex. Forward Lean Adjustment  12° or 14° with Power Wedge. Cuff Alignment  Dual +/- 2 degrees. GripWalk® Outsoles Available Separately  Removable and interchangeable ISO 9523 alpine rockered soles for K2's BFC boots collaboratively designed to work with Marker's Grip Walk binding system for better grip and added comfort when walking and standing in boots, but doesn't compromise the power transmission and release function between the boot and binding when skiing.